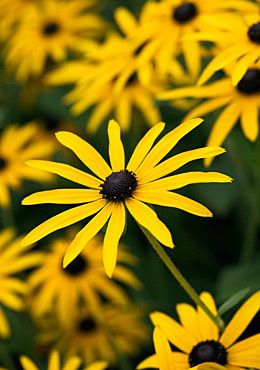 Description: Rudbeckias are easy-to-grow perennials featuring golden, daisylike flowers with black or purple centers, and include the popular black-eyed Susan. Outstanding Features: Rudbeckia work equally well as a complement to blue and purple flowers, like Russian sage and Veronica and mixed in with other jewel tones, like Sedum ‘Autumn Joy’, Purple Coneflower and New England Asters. Rudbeckia also make great cut flowers and even the seed heads will hold up in arrangements. Attracts butterflies. Tips: Apply a thin layer of compost each spring, followed by a 2-inch layer of mulch to retain moisture and control weeds. Water plants during the summer if rainfall is less than 1 inch per week. After the first killing frost, cut stems back to an inch or two above soil line. Divide plants every 3 to 4 years as new growth begins in the spring, lifting plants and dividing them into clumps.